Please note: this competition is now CLOSED. Congratulations to Sarah Louise Harrison, who won the shirt! So it’s finally here: the anticipation, the hope, the belief that Wayne Rooney might just show the world what he’s made of this time. In just under 2 weeks, Roy Hodgson will lead his brave boys into battle against the finest teams in the world in Brazil. We can’t wait, and to celebrate, we’ve decided to give you lovely lot the chance to WIN a England Shirt just for completing an order with us! To be in with a chance of winning the shirt, all you have to do sell some items (CDs, DVDs, Games, Clothes, Electronics – the choice is yours), send them to us before the 8th June (for FREE!) and then sit back and wait to see if you’ve won. We’ll announce the winner of the competition, picked from a random prize draw, on the 10th June. The winner will be announced on Facebook and Twitter, so head over and hit like or follow! 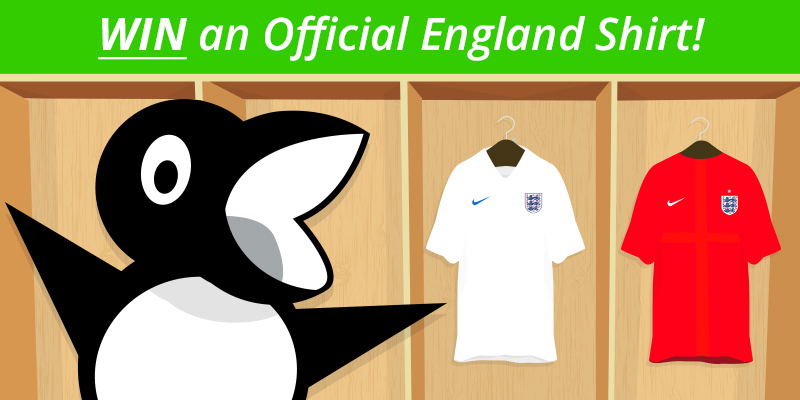 The winner will get a shiny new England shirt (which, as the media has been reminding us, costs up to £90!) and we’ll do our best to get it to you by the 1st England game (which is the 14th June*), so you’ll be all set to roar on Roy’s boys to victory (hopefully). *We cannot guarantee the winner delivery of the prize before 14th June 2014, but we will do our best!